No, Nano Silver 10 PPM, a nutrient, cannot legally prevent, treat, cure, mitigate or diagnose the flu. That’s because, under the 1994 Dietary Supplements Health and Education Act (DSHEA), no nutrient can be said to do any of those wonderful things. Only pharmaceuticals can. 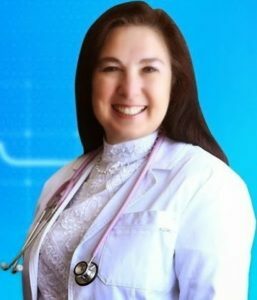 So, legally, no, Nano Silver 10 PPM is not allowed to prevent flu or anything else with a medical name. Now, biologically, there is something else to be considered. The US Government conducted and paid for research that shows that this particular Nano Silver 10 PPM so supports your normal immune system that a virus will not succeed in attaching to a cell, penetrating the cell and replicating in the cell. If none of that happens, of course, then there is no disease. Legally, Nano Silver 10 PPM is not preventing anything. It’s not treating anything. It’s not mitigating or curing anything either. Nano Silver 10 PPM does what nutrients are allowed to do: supporting normal structure and function. Logically, of course, if you have a simple, non toxic nutrient that anyone can take without any side effects that makes it possible for you not to get sick because your supported immune system makes it impossible for the organism to make you sick, that would seem to be a good thing to do. You would, of course, want to ingest to promote your health and well-being. And to make sure that others you care about have access to, as well. You can get it here, www.NSFMarketplace.com/mainstore, while our supplies last. Since “Big Brother and his Pharam Phriends” do not want you to know about, or use, Nano Silver 10 PPM, you have to do things a little differently to get access to it now that AmazonPay joins the list of globalist running dogs that have cut us off for no other offense than telling the truth and making this and other power nutrients available. You must, however, pay by check since “the powers that be” do not want to allow you to use payment cards, though Nano Silver 10 PPM is lawful to sell. Our shopping cart is set up so you can easily pay by check. Just remember to include the order number our system generates on the check that you send to us at Natural Solutions — 58 Plotts Road — Newton NJ, 07860. To be fair and unbiased, it is now official that the flu shot does not prevent the flu either. You see, first of all, vaccines prevent nothing. But even if they did, this year’s flu shot is designed to “protect” against the H1 strain of the virus while the circulating disease is the H3 strain. Illogically, though, you are being officially warned that although it is pretty much useless, you should take it anyway, although it contains both mercury and aluminum, as well as a witch’s brew of other things no rational person would ever inject into anyone, because, according to the pundits, well, you might be exposed to the H1 strain and, well, you never know. And that is supposed to pass for medical science. Let’s start with the epidemic: headlines are screaming that people, including children, are dying in huge numbers in California. Well, no, actually they are not. This graph clearly illustrates that there is no epidemic compared to 2 out of the three previous years, if the CDC is to be believed. 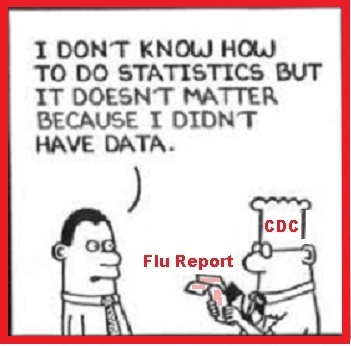 Here is a question that is not being answered: of the people who died “due to the flu” [and we will get to why that phrase does not, in reality, mean very much in a moment], exactly how many were vaccinated, how many times and over what period of time? My professional opinion is that, given the strong push to vaccinate everyone, and given the government’s vaccine statistics, it is highly likely that the more often they were, in fact, vaccinated (for flu and for anything else) the more compromised their immune systems were. That means the more likely they were to succumb to an uncontrolled cytokine storm created by the virus when the immune system was too weak to deal with it. When we are told that people died of the flu, it is listed as a P&I death, or Pneumonia and Influenza. And just exactly what does dying of P&I (Pneumonia and Influenza) mean? If all deaths associated with pulmonary problems are listed as P&I on both the manual and the machine generated death certificates, then we know that the statistics are skewed since all pulmonary function deaths are lumped together – see the cartoon at the head of this article! We do know it means that someone is dead, that is, we know that IF the statistics are accurate – and they most often are not! Remember the “250,000, (oops!) that was really 36,000 flu deaths per year” during the Avian flu scare a few years back? The number turned out to be approximately 60 deaths, primarily in the vulnerable elderly, almost all of whom were vaccinated ‘against’ the flu. 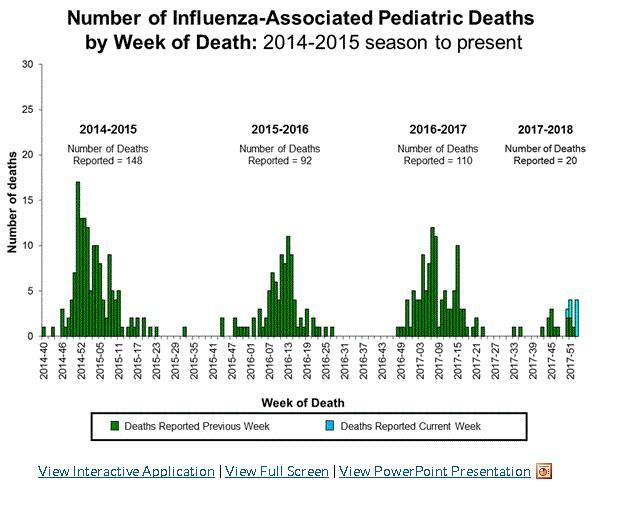 But, regardless of the number, what does it mean to “die of the flu”? Actually, during a flu propaganda push, anyone who dies of anything related to pulmonary function is listed as having “died of the flu”. This gets a bit technical here, but stick with me. It is vital to understand this in order to decode the lies and nonsense bleating out at us from a wide array of propaganda outlets, both governmental and otherwise. So it is anyone’s guess just what these labs are reporting, yet the hysteria pumps out as if the lab results are accurate. Further, the CDC’s own site on the matter tells us that the so called medical science information we are getting cannot be taken seriously: “The number of specimens tested and % positive rate vary by region and season based on different testing practices including triaging of specimens by the reporting labs, therefore it is not appropriate to compare the magnitude of positivity rates or the number of positive specimens between regions or seasons.” [Emphasis added – Dr. Rima] yet that is precisely what the vaxx pushers are doing. and you will notice that these data include information from the labs that do not report the subtypes and that the number of subtype A (H3) is decreasing sharply. The first week of 2018, in fact, showed a marked drop from the previous weeks and is less than any time in the previous three weeks. Not good for an epidemic, I would say. Now consider this morsel of data: the shortage of IV fluid bags is making it more difficult to treat people successfully for the flu, resulting in more [that means, preventable] deaths “from” the flu. This is currently being blamed on the devastation in Puerto Rico’s IV bag factories. However, as a physician administering chelation and IV vitamin C, I know that the FDA has manufactured the IV fluid shortage over the last several years, making the administration of these vital nutrients (which deal with infections like flu, very, very well) increasingly more expensive and difficult to obtain. When, for example, I finally got two infusions of Vitamin C into General Bert during his disastrous final hospitalization, I had to provide my own IV bags because the hospital insisted that it did not have enough to use for him. That was in January and February of 2017, long, long before this latest hurricane season. This artificial shortage suppresses not only your health freedom, but your well-being as well. So what, exactly, does dying “from the flu” mean? It means, among other things, that the patient did not receive an infusion of intravenous Vitamin C to assist the immune system in dealing with the viral assault. It also means, in all probability, that the immune system was previously weakened by the assault of vaccination. If the personnel in the hospital were vaccinated “against” the flu, then it means that the vulnerable patient was also, in high probability, assaulted by infective personnel since recently vaccinated people shed infective viral particles for period ranging from 21 days to 30+ years! So is Nano Silver 10 PPM “allowed” to cure flu or anything else? No, by US law. Does it nutritionally support your immune system doing its job? Absolutely. Do I recommend it? Without hesitation. AMA & Australian Media Blame Anti-Vaxxers For Flu Related Baby Deaths But Where’s The Evidence?